When your WHY is big enough you will find a way. By setting her intention Stacey Huish has been able to achieve success in making her vision a reality. It is very hard for some kids out there. Especially for those kids who do not have the blessing of supportive parents. 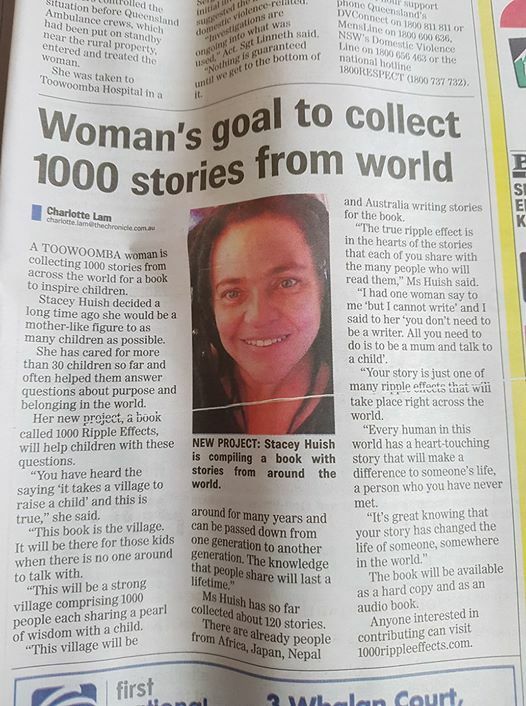 Stacey Huish, is the inspiration behind this idea and is looking for authors (first-time or experienced) who’d like to contribute to her 1000 Ripple Effects Book Project. The goal being to hug every child in the world with the words that are written in these stories. Chris Henderson who is also known as the Courage Catalyst spends time with Stacey Huish. Stacey is a courageous Woman who takes massive action towards achieving her goals. Chris asks about "How do you prevent overwhelm?" and "What is the best thing about being a parent?" Listen in as Sigrid De Kast from Sticky Beak Marketing interviews Stacey Huish. Fred Gillin talks to Stacey Huish about her Very Special Project. 1000 Stories, creating 1000 Ripple Effects right across the world. 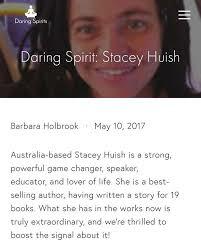 Stacey Huish is featured as a Daring Spirit in an article written by Barbara Holbrook. a feature article on the book project! Share Your Story Interviewed me about my life and about the 1000 Ripple Effects Project! This was a written questions and answer.... have a read through! A fun and exciting interview with many people from all over the world..... People got to ask me any question they liked about the 1000 Ripple Effect Project, Me, and what I am doing! I had a lot of fun answering all of their questions..... Have a read through the answers. Step Up and Speak Out with Trish hosted by Trish Springsteen Live from San Diego with Special Guest 1000 Stories Creator Stacey Huish at 7:00 PM EST America Thursday, March 2nd and Friday 10:00 AM in Brisbane, Australia]Hello everybody. Our multi award-winning host, Trish Springsteen will broadcast her 26th episode of Step up and Speak Out with Trish after a 12,000 mile journey live from San Diego, California at 7:00 PM EST Thursday, March 2nd and Friday 10:00 AM in Brisbane, Australia] on the Coach on Fire Radio Network (#CoachonFireRadio) with special guest 1000 Stories to answer lifes unanswered questions creator Stacey Huish. Stacey Huish is a game changer. Her purpose to publish a book with 1000 authors is amazing. She is a free spirit who is a lover of life, a heart healer and an earth healer. Stacey wants to help as many people as possible to live passionate, purpose filled lives. Her passion for life and her project really shines through in this interview. 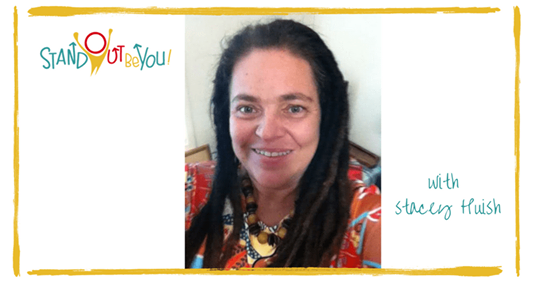 On this episode of the Stand Out Be You Podcast, your host Tequila Dodard is joined by Stacey Huish a speaker, educator, and author who has spent her life on a mission to heal those around her, as well as people in the wider world, especially children and teenagers. She's not only helping authors get recognized but she is also having authors give back to teenagers transitioning from teens to adults. Most people say, ‘Oh young people, they don’t listen.’ They do. They do listen. If you show them that you care about them and you want to help them, they listen and they take your advice. It is amazing how much that they do take on. As a caring and courageous mum, Stacey knows what it means to truly support the growth of a young adult in all the ways that matter. Kathryn Elizabeth Jones interviews Stacey Huish about the 1000 Ripple Effects Book. Dr. Robyn Mills interviewing Stacey Huish. Writing/Story Telling is something we must all do in our own individual way so we have brought you a woman who is unique and vibrant, loves people and life. Stacey Huish has successfully grown 5 start up businesses, founded a Not for Profit Organisation, Contributed a story to 21 Books and Authored two books. Writing/Story Telling has been a major part of her success. As a Social Entrepreneur, 1 Million Women Ambassador, Speaker, Educator, Author she is a freespirit affectionately known as the Game Changer. Raising the vibration of others to live passionate, purpose filled lives whilst healing heart, planet and enabling divine purpose to unfold. Stacey is going to share with us the simplicities of writing/story telling successfully. How to, how not to and to be true to yourself along the way. Writing/story telling can be something more than just following a program or protocol and it can be for many reasons.